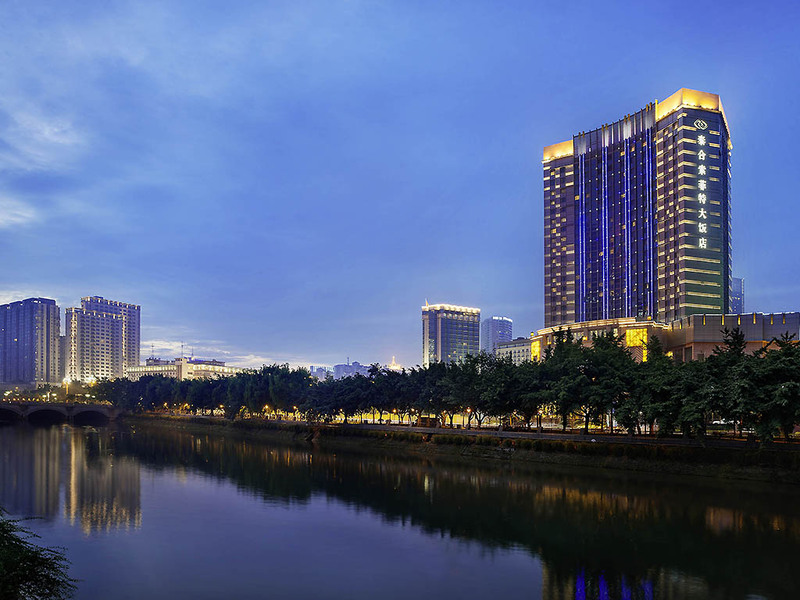 Sofitel Chengdu Taihe is located on the Funan River, just 20 minute drive from Chengdu Shuangliu international airport and 15 minute walk from Central Square and the commercial hub of the city. The hotel features 262 elegant rooms, 3 restaurants, 1 bar, a heated indoor swimming pool and gymnasium. Conference facilities are also available for up to 500 delegates. Sofitel Chengdu Taihe's 262 rooms and suites are stylishly designed and furnished with all the modern conveniences, including broadband. Business clients will feel at home in our fully-equipped Executive Rooms and Deluxe Suites. Inspiring river views. The soft embrace of the Sofitel. Sophisticated design. Sofitel Chengdu Taihe suites invite guests to revel in the luxury of space lounging in 5-star elegance at the heart of the city. Chinese Restaurant located on the 3rd floor. Serves authentic Cantonese and Sichuan cuisine. Western Restaurant located on the 2nd floor. Offers extensive buffets, delicious a la carte specialities and all day dining. Japanese Restaurant located on the 2nd floor. Serves delicious sashimi and other exclusive specialties. Perfectly located on the 23rd floor. Continental Breakfast is served from 06:30 AM to 10:30 AM. Complimentary tea and coffee during the day, complimentary cocktails from 06:00 PM to 07:30 PM. Will not return. Will not recommend. Staff did not recognise Accor Elite status at check-in. Elite members usually receive a welcome drink, a welcome letter from the hotel manager, late check-out offer, and possibly a room upgrade. None of this happened to me. Worse, I was allocated a room facing a construction site. Location wise, although it is located in the city centre it is not really walkable to anything except a subway station. There are absolutely no shops or restaurants nearby. Room is also compact. I will not return and cannot really recommend this hotel to anyone. Stayed on 20th floor so had a good view over the city. Room very comfortable with good lighting. Excellent service in the buffet restaurant with a wide selection of tasty dishes. The hotel was within comfortable walking distance of a Metro station. Great location by the side of the river. Hotel feels very luxurious, with great guest rooms and comfortable beds. Excellent choice at breakfast buffet and lovely bar lounge for relaxing after a hard day of sightseeing. Staff were very helpful especially concierge and reception staff. Pros: The room is nice, clean n big. Friendly staff. Cons: Bed/mattress is not exactly comfortable. Location is not their plus point. No restaurants nor convenience store within 15 mins of walking from hotel. Free upgrate and helpful associates. Breakfast is also good. Service was excellent. On par with what we expected with Sofitel hotels. Great stay, very friendly and helpful staff (going extra mile, that is very appreciated), room clean. From my check-in to my check-out (5 nights). First impression is nice hotel, well located, as a foreigner who doesn’t speak Chinese, to have a perfect English speaking person (Mr. Light Luo) at the check-in desk is awesome, he is very friendly, smiling, helpful and cheerful; the concierge is very helpful and nice for my heavy luggages. Room is clean as expected, spacious, nice view. Staff in general is very nice, friendly, smiling for most of them. I just think a simple hello, bonjour or nihao is what all the staff of the 5 stars hotel should say to any customers. Beside that I definitely appreciated my stay at your hotel, so whenever I will come back to Chengdu I will definitely stay again at your hotel. Thank you for making my stay enjoyable not only at your hotel as well in Chengdu. Due to some last minute changes in my travel schedule I booked the hotel through the recommendation of a friend of mine who had previously stayed at the hotel. I booked through the website for a non-smoking room as I am slightly asthmatic and partial to cigarette smoke. However, the room allocated to me on a non-smoking floor unfortunately had some lingering cigarette smell (probably due to previous occupant(s) who smoked notwithstanding it was a non smoking floor). I informed the receptionist and she was so kind to upgrade me to another room which was a suite and the concierge accompanied me to ensure that the room was indeed smoke free. The view was good as my room faces the river and it was quiet and peaceful in the hustle and bustle of the city. I must say throughout my stay there I felt well looked after. The hotel sits on central locality which is near to the major attractions like Wuhou Memorial Temple and next to it, Jinli Pedestrian Street. Check in and check out was hassle free. I would not hesitate to stay at Sofitel for my next visit there. Mr Luo the desk manager was also very helpful. - The staff that handled my check in marked the start of bad staying experiences. I had used my Accor points to book the room but the staff insisted that I had to pay the full price for them. He made nasty face at me when i try to explain. No apology was offered even after he checked and confirmed that no payment was required. - Room is nice but was shocked to be told that they do not provide spoon or stirrer in the room. Wonder how they expect the guests to make coffee/tea. Lack of attention to such basic detail was a let down. - Ordered in room dining twice. i’ll give 2 out of 5 for the food. Room upgraded. Friendly and helpful receptionists, also handsome. Welcome fruit and biscuits. Nice room and view. I had stay one night there with my points of Acoor and never stay with Sofitel before. It was really disappointing experience with them. It's not worth to pay around A$160 stay with this place and better avoid it. There were many issues of my room: 1. The mattress is very hard and unbelievably discomfort. 2.The safety locker couldn't lock it at all . 3. No cold water at bath tub. 4. The toilet didn't flush well. The staff were very attentive, helpful and friendly. The staff are kind, friendly and helpful. The people at the restaurant are super nice and customer oriented; the cook at the noodle bar is warm and friendly. Hotel is well maintained; room is spacious and comfortable. The room was comfortable and the staff helpful and very kind. However, the quality of the food wasn't particularly high (IMO it used to be better in the past). Great trip. Loved my room and the breakfast. I was disappointed the Sofitel lounge was closed in the mornings as that was the only time I could use that area. Also, I loved the free 3 pool spa in the Men's locker room, but my second day it wasn't available until 11:30am and I didn't have time to enjoy it a second time. Club Lounge only opens from 12 noon so no meeting room for a morning meeting and club services. Breakfast was poor except the excelllent chef at the noodle bar was trying to save the situation. Room upgrade for Platinum member to a mini suite was good but not generous. The food during lunch at the Chinese restaurant was however suprisingly delicious and the AccorPlus value was superb. Overall a good stay at the end supplemented by the good value lunch. Good location, good service and hospitality. &quot; Winney &quot; was very helpful in helping us out with travel issues.